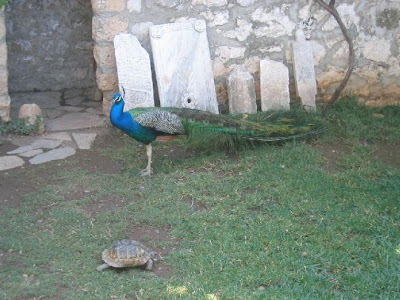 ONCE upon a time a peacock and a tortoise became great friends. The peacock lived on a tree on the banks of the stream in which the tortoise had his home; and daily the peacock after he had a drink of water danced near the stream and displayed his gay plumage for the amusement of his friend. One unfortunate day, a bird-catcher who was on the prowl caught the peacock and was about taking him away to the market. The unhappy bird begged of his captor to allow him to bid his friend the tortoise good-bye, as it would be the last time he would see him. The bird-catcher allowed him his prayer and took him to the tortoise, who was greatly moved to see his friend a captive. The tortoise asked the bird-catcher to let the peacock go; but he laughed at the request, saying that was his means of livelihood. The tortoise then said, "If I make you a handsome present, will you let my friend go?" "Certainly," answered the bird-catcher, that is all I want." Whereupon the tortoise dived into the water and in a few seconds came up with a handsome pearl, which, to the great astonishment of the bird-catcher, he handed to him. This was beyond his expectabons, and he let the peacock go immediately. A short time after, the avaricious man came back and told the tortoise that he thought he had not paid enough for the release of his friend, and threatened that, unless a match to that pearl was obtained for him, he would again catch the peacock. The tortoise, who had already advised his friend to betake himself to a distant jungle on being set free, was greatly enraged at the greed of this man. "Well," said the tortoise, "if you insist on having another pearl like it, give it to me and I will fish you out an exact match for it." The cupidity of the bird-catcher prevented his reasoning that "one in the hand was equal to two in the bed of the stream," and he speedily gave the pearl to the wily tortoise, who swam out with it saying, "I am no fool to take one and give two!" and forthwith disappeared, leaving the bird-catcher to be sorry ever after for his covetousness.